In a previous post, I discussed the concept of e-mail archiving in the cloud and ran through some pros and cons of hosting your e-mail archive off-site. Today we’ll take a quick look at on-premise e-mail archiving. Having an on-premise e-mail archiving solution simply means that the e-mails that are archived remain within the organization’s infrastructure. Such a solution would typically be installed on a separate server to the e-mail server and have a dedicated storage area (i.e. a SAN or database server). 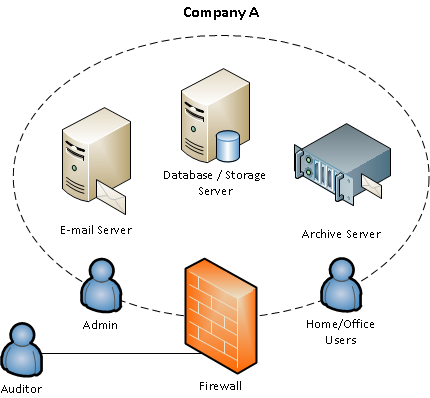 In the image above, the Admin and Home/Office Users sit on the boundary of the company’s infrastructure because access to the e-mail archive is usually allowed from inside and outside the organization using either a Web Interface or E-mail Client integration utility. Aren’t an archive and a backup the same thing? Not quite. An archive can be considered as a long term record of your e-mails that can be referenced at any time in the future. A backup is typically a short term retention of your e-mail data that is taken in snapshots at regularly scheduled intervals (daily, weekly, monthly, etc). Archived e-mail can usually be searched, retrieved and restored quicker than a backup. Most on-premise archiving solutions make use of ‘stubbing’ or ‘journaling’. What’s the difference? Stubbing is the process of creating a pointer to the original e-mail stored on the archive server, as opposed to the mailbox storing the full message content. When the user then clicks that pointer, the full message is retrieved and displayed to the user. Journaling involves making a copy of every e-mail that passes through the e-mail server and storing it in a special ‘archive’ or ‘journal’ mailbox to then be pulled by the archiving solution into a database. 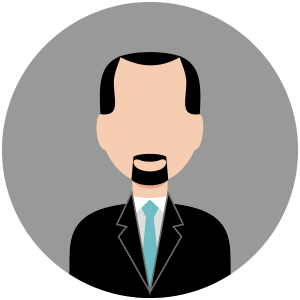 Using an archiving solution has the obvious advantages of allowing the organization to be compliant with regulations, reduce the load on the e-mail server, and move away from the pains of PST management at both a user and administrator level. The main benefit of an on-premise archiving solution is that you have total control over your e-mails; your e-mail archive never has to leave the company walls (unless of course you took a backup tape off-site!). You normally also pay one price for a full feature set and then choose the amount of mailboxes you need to archive e-mails for. If you configure things correctly and the software allows for it, you will probably have better search performance when compared with cloud based solutions – especially on larger databases. When choosing an on-premise solution it is worth planning for the costs associated with hardware (think storage, additional servers, etc) and maintenance (since the servers will be hosted on-premise someone will have to manage and maintain them), as well as a migration strategy for the e-mails that are currently sitting on your e-mail server. These are two important points that are sometimes overlooked when an eager admin rushes into purchasing an archiving solution without first having a plan of action. As I said in my cloud archiving post, when choosing which solution to go for there is really no right or wrong. It’s up to you to evaluate the pros and cons and decide which solution best fits your organization. The important thing to keep in mind is scalability – don’t put yourself in a position where your e-mail archiving solution can’t grow as your business grows. My Microsoft Outlook automatically tells me to archive my email messages. The reminder comes once a month. I used to archive my email once a year but i dont recommend this. I dont rely solely on archiving. I also backup my emails, schedules, tasks, and notes to my external hard drive. It’s better safe than sorry. What you are suggesting makes perfect sense for home or SOHO users, but will probably be a headache for IT departments in larger organizations if they were to rely solely on each user individually archiving their e-mails from Outlook. This is where archiving to a central location comes in handy and makes e-mail management so much easier. Having said that, if users also want to have their own local backup strategy for their Outlook profile items then more power to them! For me, email archiving is more practical than backup. One superiority worth mentioning is that the former can be used, applied, and accessed as a SaaS (software as a service) aka on-demand software. The growth of cloud-based computing can be attributed to the rising demand of email archiving solutions. Moreover, aside from SaaS, email archiving gives more storage optimization and offers more organized data than the backup. Well said Furius_Geek; thanks for your views. If I were an e-mail administrator being faced with having to restore a particular set of e-mails, I’d be more at ease knowing I had an archiving solution to help me out, rather than having to dig through backups and go through the restore process.